Out of the 354 perfumers included, 38.1% are female. That 38.1% figure is relatively skewed by the inclusion of independent perfumers, 71.9% of which are female. Many independent perfumers are independent in the first place because the traditional perfume industry is not accessible to them, so they should not be used to give a falsely rosy image of the perfume industry’s demographics. When independent perfumers are factored out, 38.1% becomes 34.5%– barely one third. 34.5% is certainly progress, and there have been many encouraging steps for women in the perfume industry in the past few years (prestigious perfumery school ISIPCA now has more female students than male). But 34.5% is not equal representation, and it’s hardly “a non-issue” just yet. But who cares? As Roja Dove is fond of saying, there are more astronauts than perfumers. (Thankfully, the astronauts take diversity a little more seriously.) Why should a lack of diversity matter to anyone else outside of a tiny industry? It matters to everyone who wears and loves perfume. Diversity goes far beyond physical characteristics; it means diversity of perspective, new and different ways of thinking. Anyone who’s visited a perfume counter lately knows that new perspectives and new ideas are desperately needed in the perfume industry. When it’s the same white French guys making our perfumes, we get the same perfumes over and over. And I don’t know about you, but I just can’t smell another Flowerbomb clone. Methodology: For the purposes of this spreadsheet, I defined “perfumer” as “a living person who could be confirmed to have created fragrances”. I excluded brand figureheads who could not be confirmed to have created their fragrances. If I have incorrectly excluded anyone, I sincerely apologize. I also sincerely invite you to create your own spreadsheet, because this one took three days. I defined “independent perfumer” as “a perfumer who has never been employed by a fragrance firm”. This definition was trickier, but it made more sense to me than “a perfumer who is not employed by a fragrance firm”, as that definition would group perfumers such as Bertrand Duchafour or Francis Kurkdjian with smaller indie perfumers. Loved the article. It makes you stop and think especially when three out of four consumer buyers are female. So, so true, Kim. It kind of reminds me of the fashion industry, actually- I’ve tried on so many clothes or shoes that made me think, “You can definitely tell a man designed this”! It is absolutely true that are not enough female (and non-white) perfumers. They would definitely bring new perspectives and experiences to the creation of perfumes. But this would work only if the companies commissioning the scents were willing to take some risks rather than just wanting the next fruitchouli to make money on instantly. Part of the problem is the use of test marketing groups — most people like only what they smelled and liked before. Angel exists because Mugler wanted something different and had a strong female industry proponent. It might have been slow to catch on widely, but Clarins was willing to commit considerable resources to interested department stores to create large stand-alone counters. There is a reason that the Hudson’s Bay in Canada got exclusive initial marketing rights in North America to Mugler’s Exceptions. As for Francis Malle there is no excuse. Women and non-whites given that budget would be equally creative and perhaps even innovative. This month-long series of posts has been great. Thank you. I have the smartest blog readers! All excellent points- no perfumer, regardless of gender, can create a particularly interesting fragrance for a brand if the brand is determined to play it safe. Thank you so much for sharing the fascinating Mugler statistics. 38.46% could certainly be worse, but I still can’t believe they got a male perfumer to make something called Womanity! Great article Ari. 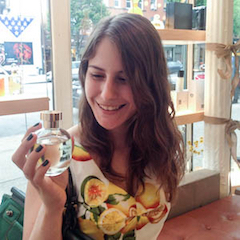 Diversity of perfumers could bring exciting new things to the table. I’m so glad you liked the post, Sun Mi! The perfume industry is definitely making progress on becoming more diverse (Symrise tweeted a picture of their perfumery school graduating class last week- four women, one man), but the best way to keep the momentum going is to keep the pressure on! It’s uncertain. People nowadays go to great lengths to look good and feel great. I think the urge of using designer perfumes has quiet fascinatingly increased. Of course,I’ve never given it thought as to who is the perfumer or nose behind it. I love the English lavender from Yardley for it’s classic scent and wonder who is the perfumer behind this great fragrance.